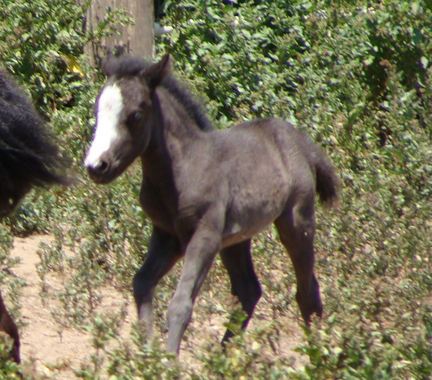 Parading of the first foal. Something we've noticed that the first mare that foals does every year! A strange equine show and tell, I guess! 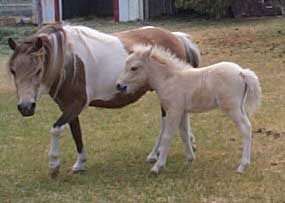 We've been breeding Miniature Horses since 2000 and our breeding herd is from the top winning bloodlines in the country. We don't sacrifice pedigree or color over conformation though. Our breeding herd must have excellence in conformation, soundness of mind, intelligence, and move well. As we choose not to show at this time, we do spend alot of time and attention keeping current with what is winning and how that will fit with our breeding program. 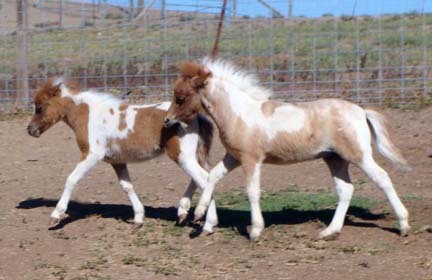 Our breeding herd is DNA/PQ tested (PQ if possible - although I personally will no longer Parent Qualify horses I have not bred! ), so we know what you're getting is what we say it is! 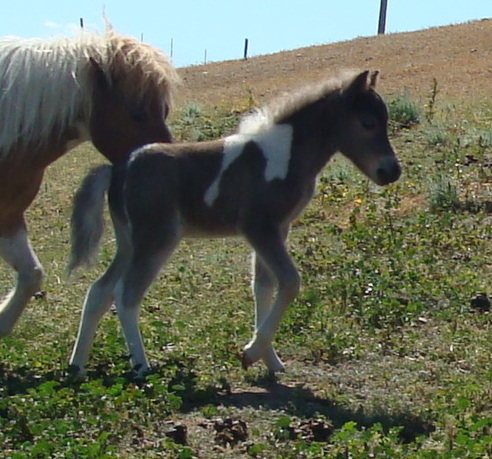 In general we keep a short breeding season (usually about a month or one-two heat cycles) with foals born in April-May. This way we avoid the extremes in temperature we can experience earlier or later in the year. Foals receive their first hoof trim at one-two months and are put on a regular de-worming program (Safeguard until six months). 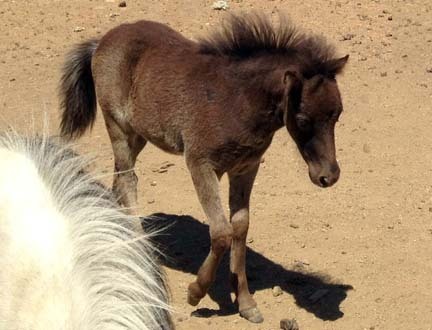 We do not wean until the youngest foal is five months, so they can be weaned in a group. 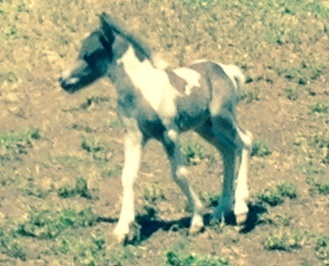 That means our foals are ready to go to their new home between October 1st - 15th. 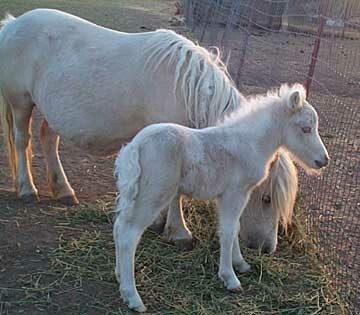 No board is charged until a foal is weaned. We do not vaccinate before six months of age. 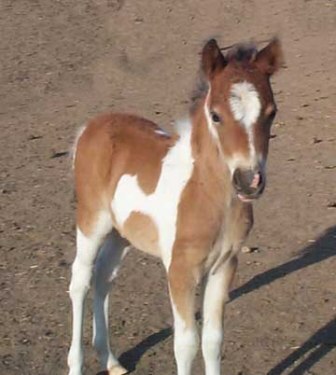 Purchased foals can be vaccinated through UC Davis or with the new owners vet. As always, any of our colts can be purchased on a gelding contract. Please contact us for details. If you would like your new colt gelded, we're happy to make the arrangements through UC Davis, but this is dependent on fly season! You will be billed directly by UCD. 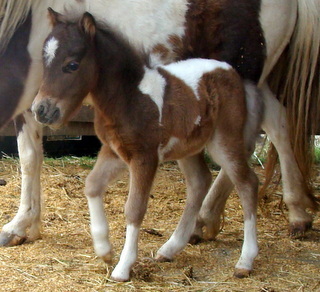 A 25% non-refundable deposit with a signed contract will hold a foal until weaning. 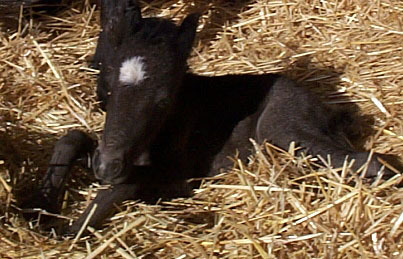 Foals are to be paid for in FULL prior to leaving unless previous contractual arrangements are made. 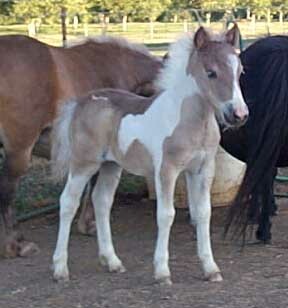 We prefer to have all registration completed before a foal leaves including the DNA/PQ testing for AMHA horses. If you'd like to come and see the Minis, please call or email us ahead so we can set time aside for you. We are generally available most mornings by appointment. We do not encourage afternoon visits in the summer heat. Wesco Farms TCs Equinox Ambush "Freddie"
Wesco Farms TC Mia Monchhichi "Mia"